Can Amino Acids Make You Gain Weight? Amino acids have the potential to cause weight gain, but their impact depends on a few variables. Like carbs and fats, amino acids contribute calories, which must be balanced by your activity level and energy needs. Amino acids are different from carbs and fats because they're essential for building every part of your body, from muscles and skin to blood and organs. This means they should be used to produce proteins before they end up being stored as fat. Carbohydrate, fat and protein -- the three macronutrients -- provide fuel to energize your body. Sugar from carbohydrates is the body's first choice for energy, then it turns to fats if carbs run out. While amino acids from digested proteins can be turned into glucose for energy, they're more essential for building your body and maintaining healthy tissues. As long as you have enough calories to meet your energy needs, amino acids are first used to synthesize new proteins. If you have excess amino acids, they're used for energy or converted into fat. Amino acids contribute 4 calories for every gram of protein you consume. Carbohydrates also have 4 calories per gram, while fats are a more concentrated source of energy, with 9 calories per gram. Because they contain calories, amino acids can end up as extra pounds of fat on your body. However, the only way amino acids cause weight gain is when you consume more total calories than your body uses for energy. Depending on your age and activity level, women need 1,600 to 2,400 calories daily, while men should consume 2,000 to 3,000 calories, estimates the Dietary Guidelines for Americans 2010. Rather than worrying about calories from amino acids, plan a menu that provides all of the nutrients you need, while staying within calorie goals, recommends the Centers for Disease Control and Prevention. First determine the optimal number of calories you need, then divvy up the total calories between carbs, fats and amino acids from proteins. The Institute of Medicine recommends getting 10 to 35 percent of your total calories from protein. Forty-five to 65 percent should come from carbs and the remaining 20 to 35 percent from mostly unsaturated fats. The source of your amino acids affects their potential to make you gain weight. 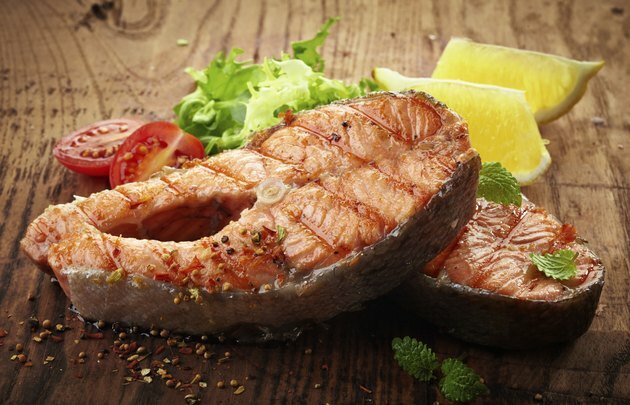 You'll get about 21 grams of protein from a 3-ounce serving of meat, poultry or fish. If you choose fish such as flounder, you'll only consume 100 calories, while lean beef and a chicken breast have 170 calories, and high-fat meats such as chuck roast contain nearly 300 calories, reports the U.S. Department of Agriculture. Beans have 7 grams of low-fat protein in a 1/2-cup serving. Nuts, seeds, quinoa and other whole grains are also sources of protein, but their calories vary, so check the label. Protein drinks can be high in calories, with about 110 to 210 calories per serving. Amino acid supplements only have around 15 to 20 calories in a dose, but if you're watching calories, they still count as part of your daily intake.